40th match of ICC Worldcup 2015 has been played between Australia and Scotland at Bellerive Oval, Hobart today. Rain disturb match after Scotland inning but, Australia with good all round cricket out played Scotland by huge margins of 7 wickets. 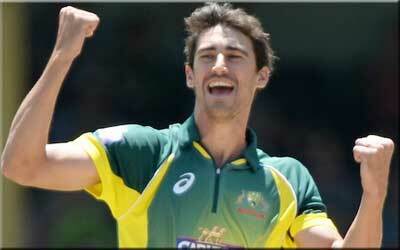 MA Starc declared man of the match for his tight bowling spell with 4 wickets in his 4.4 overs spending just 14 runs. Earlier, Australia wn the toss and put Scotland into bat first. Scotland kees down against Australia pace atack and all out scoring just 130 runs in 25.4 overs. MA Starc picked up 4 wickets and PJ Cummins picked-up 3 wickets for Australia. Rain delayed the match during half time. Australia chased given target very quckly just in 15.2 overs having lost 3 wickets and won the match by 7 wickets (with 208 balls remaining).